A few of the songs last a minute or two too long and I might have dropped a couple tracks to scale back the run time a bit more as well, in particular the closer "No Lights On The Horizon", which is the most uninspired of the bunch. The title track hearkens back nicely to "Empty", the opener of the band's second (or third, depending on how you're counting) album Live It Out (2005). 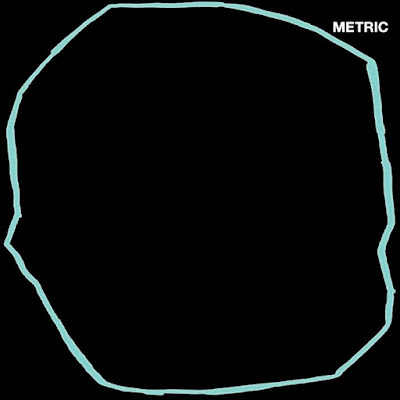 Some of the choruses get a bit repetitive in the lyrical department and those hoping for another Old World Underground... (2003) or Fantasies (2009) won't find it here—instead you get the slickest Metric album to date. Come to think of it, this is probably my least favorite album by the Canadian quartet so far, but it's still an incredibly catchy collection of pop tunes, don't get me wrong. Final nitpick: minimalism can be cool but that cover is just lazy. Highlights include "Die Happy", the Hi-NRG tinged Moroderesque "Now Or Never Now", "Underline The Black" and "Dressed To Suppress".